"This vegetable side dish is a great alternative to beans when the main dish has a south-of-the-border flair! I have made this with canned ingredients, but the fresh ingredients taste much better!" Heat olive oil in a large skillet over medium heat; cook and stir onion in hot oil until tender, 5 to 10 minutes. 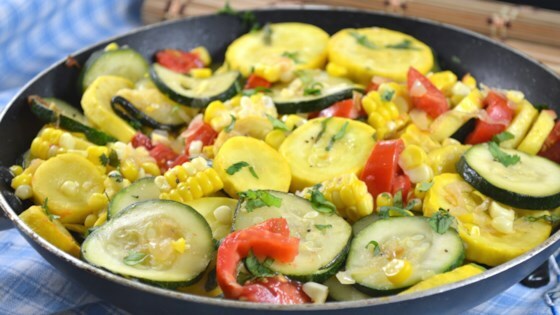 Stir zucchini and yellow squash into onion; cook until slightly tender, about 3 minutes. Add corn; cook for 1 minute. Stir tomatoes and garlic into onion mixture; cook and stir until heated through, about 3 minutes. Season with cumin, salt, and pepper. Cook to desired doneness, 5 to 10 more minutes. Sprinkle in cilantro; stir until wilted. Remove from heat and squeeze lime over mixture. It's burger time, only meatless! I made it .. It was wonderful I added potatoes.. This has been a go-to for Farmer's Market Bounty, thanks Bibi! Love the flavor from the cumin and the pretty colors.